With the advent of autopilots, it was felt that the demise of the older mechanical self steering systems was only a matter of time. But it is now apparent that is not to be; they both have their place. Especially for ocean passages, you cannot beat the quiet simplicity and reliability of a good self steering system… the boat being powered by the wind and steered by the wind. The symmetry is compelling. The wind never blows from a constant direction; it is always fluctuating and varying. The best course for a boat under sail is to hold an angle fixed to the wind. A self steering windvane steers to the apparent wind and is therefore always in sync with sail trim. This means that the boat’s course meanders with the wind. It is not a straighter course, but over long distances is much more efficient and surprisingly faster. An autopilot is clueless about the direction of the wind (unless set up with a wind sensor). It plods onward fixed to a magnetic course while the wind wanders freely. On longer passages it’s impossible to constantly trim the sails and autopilots can suffer severely from that poor sail trim. We really do love our below deck autopilot too. It’s great for motoring and short hops, but that comfort changes when a few hours of usage becomes 24 X 7. The realities of offshore are very different. The power consumption of an electronic autopilot in big seas compounded over days is astronomical. Who wants to run the engine or generator 2 to 5 hours per day to keep the autopilot going? There is something the matter with that picture – running engines to keep sailing! This is when mechanical self-steering proves to be indispensable – it requires no power and the windier it gets the better it steers. An energy neutral boat provides much piece of mind, if you can achieve it. When you take away the autopilot’s voracious need for power, especially when the going gets tough, a large responsibility is removed, replaced by a quiet confidence in the boat’s systems. Of course, the Achilles heel of electronic autopilots is the inevitability of break-downs. For a shorthanded crew the alternative of hand steering would be exhausting. Even if the autopilot itself never fails, failures of many other devices can stop the flow of electricity and, in turn, render an autopilot useless. The probability of being without the autopilot, especially in bad conditions, is simply too great… and the resulting risk unacceptable. Another aspect that needs appreciating is that a more comfortable boat motion can be achieved with an auxiliary rudder self-steering system. When in use, the boat’s main rudder is locked in place and the auxiliary rudder takes over. Nothing makes a boat more stable than a fixed main rudder. The bonus is that the main rudder’s fixing position compensates for any weather helm making the boat perfectly balanced and comfortably on course. The boat knows when it is holding course. And more readily returns to that ‘on course’ position when the Hydrovane is making course adjustments. Why not invest one of those wind-sensor type autopilots that the racers use? Well the cost is big (double or up to quadruple conventional systems), reliability issues persist, and the power needs are such a tyranny. NKE in France led the way with a system that racers use. Brooks & Gatehouse now has such and perhaps Raymarine is competitive. Those are hydraulic systems with multiple boat and wind sensors that are fed to a computer that analyzes the data. To keep the systems going they need lots of power and for offshore you would still want to have a back-up system. If you can have both, that’s an ideal set up. We love the ease of using a below deck autopilot for short hops. However, if the passage is longer than a few hours, the Hydrovane will be steering. When sailing offshore, the only time we use the electric autopilot is during a sail change. And it doesn’t have to be a choice between a windvane or an autopilot. Consider adding a Hydrovane and then retrofitting with an inexpensive tillerpilot. Our hydrovane ‘Scarlet’ has been a complete star the last 18 months. We’ve covered over 18,000nm, with her steering for most of them. Our autopilot died on us about half way through our adventure, but we found that Scarlet filled in quite nicely even while we were motoring, as long as there was even the lightest of winds. I can’t imagine why any yacht would a) be without one, and b) want to use any another system. We are now in Martinique. After installing the Hydrovane, we left Tenerife on December 11 and after 18 days at sea we arrived in Martinique. At 1100nm from Martinique during the night with 30/35 knots of wind and 3 to 5 meters waves we heard 2 big noises like something hitting the boat on the side and almost immediately the autopilot stopped working and the boat went beam to the waves. The steering wheel was blocked and we could no longer steer. Not right not left. So we put down the sails, started the motor and used the Hydrovane to steer! When the day came I reestablished the sails and we finished the trip with the Hydrovane without any problems. At the end I am happy I did install the Hydrovane, especially that I saw on YouTube that at the same time 2 sailboats almost the same size as mine with the same problem. The crew had to abandon the the ships and left both boats in the middle of the Atlantic and lost everything. Now I am telling everybody to install the Hydrovane. … again thanks to the Hydrovane. It saved my boat. …one of the biggest problems of this year’s fleet was the electric autopilots. Many could not handle the punishment of being on 24 hours a day for upwards of 28 days. ‘James’ came through like a champ. We arrived after 27 days with no problems and not having to wait for spare parts to be shipped in. “Lucy” is truly an amazing device, reliable and strongly built which afforded the crew a lot of comfort: knowing that also at night we did not have to worry about an accidental jibe, would stay on the same wind angle and had much time for other things like navigation, cooking and sleeping. …the hydrovane, which worked brilliantly when our electrical autopilot failed on the ARC 2016. We had a poled out double headsail downwind rig and the hydrovane coped with the swell even in relatively low apparent wind (eg even when we were only doing 6 knots downwind in 13 knots of true wind speed), as well as in 25-30 knots and heavier swell. Three boats left Fiji together, a 35, 45 and 55 footer, all headed to New Zealand. The smaller two had self steering but the larger boat depended on its autopilot. The course was mostly to weather. The smaller boats beat the larger boat by a considerable margin! Why? Because of their self steering. The self steering systems allowed those boats to hug the wind, always keeping their sails trimmed – optimizing both their sail trim and course. With an autopilot the big boat had to keep falling off its course in order to keep its sails full, and to avoid being headed. Although sailing on a virtual ‘straight line’ course, the boat was almost always untrimmed and sailing inefficiently. Just wanted to drop you a note to let you know we made it to Nuku Hiva from PV. Our boat and two others had autopilot failures. One boat turned back to PV and the other hand steered all the way to Hiva Oa. Our autopilot failed a third of the way but we had “Jane” our trusty Hydrovane. She got us thru it all with minimal hand steering. We now know a lot more about how to set her up and how to balance the sails. I even got her working when we did some motor sailing. After various efforts with trim tab systems, Blondie Hasler invented the servo pendulum windvane system in 1961. It was Nick Franklin who achieved the first successful commercialization of self steering with his Aries gear that was introduced in 1968, same year as the Hydrovane! Aries and Hydrovane were the first two windvanes on the market. As of recently, Aries units are built in Holland. Similar systems have been produced for years by perhaps a dozen other companies. The main brands still produced today are Aries, Cape Horn, Monitor, Sailomat, South Pacific and Wind Pilot. 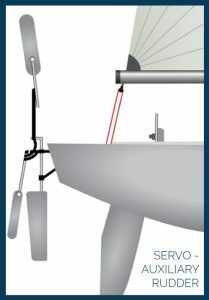 A servo pendulum system pulls a line that moves the steering wheel or tiller enough to move the boat’s main rudder to bring the boat back on course. Such a system includes a blade or paddle, called a servo blade (it is not a rudder). This blade swishes from side to side in the water, like a pendulum, directed by its windvane sensor. As the boat falls off course the wind angle changes and the vane is pushed over. Movement of the vane rotates the in-water servo blade (also called paddle or oar). Once moved from dead ahead position, the flow of the water pushes the blade to one side with force. 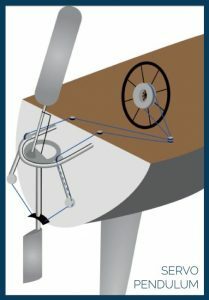 This movement pulls the connecting line to turn the wheel or tiller so the main rudder moves to bring the boat back on course. Once on course the vane flops back to vertical/neutral and the servo blade reverts to trailing in the wake. A servo system actually only pulls a line by about 10 in (25 cm), which is about enough to move the ships wheel a half a turn in each direction. Although they do not move the wheel by much (typical wheels have 3 revolutions, stop to stop) it is enough to do the job. 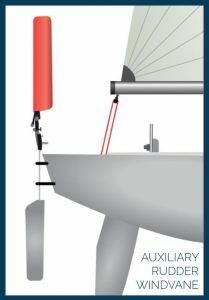 The Hydrovane (an Auxiliary Rudder Windvane system) is very different mechanically and offers additional features than all servo systems, but a comparison is still possible. We have sailed with mechanical self steering systems since 1987 and have accumulated in excess of 42,000 sea miles exclusively using vane steering. Prior to purchasing the Hydrovane we had been using a popular brand pendulum system with fine results. We did, however, tire of the cockpit being interfered with by the steering lines led from the pendulum system. As we had sailed many miles successfully with the pendulum system we were, initially, very hesitant to try an alternative mechanical steering product. After three years and 10,000 sea miles of Hydrovane steering, we are absolutely delighted. Particularly, the downwind light air performance is remarkable! The vane has been totally maintenance free and is exceptionally easy to engage/disengage. Thank you for a very fine product. It is an absolute pleasure to sail with the Hydrovane! I have to say that the Hydrovane is the best piece of marine engineering that I have used in 35 years of owning boats. In retrospect there is no comparison with the [popular servo system]. The [popular servo system] is in my opinion a state of the art servo pendulum but the choice is a matter of whether one wishes to drag a plank through the water attached to your helm or have another rudder. The Hydrovane proved to be so far superior on all points of sailing that it was as if it had been made specifically for the Tradewind 35. It simply never lost the plot – the [popular servo system] would often not let me brew a cup of tea before going off course. I confess I was a little concerned about the auxiliary rudder system vs. a servo pendulum, but the power of the hydrovane has astonished me… it is now the best bit of kit on the boat. I once had to put it in ‘second’ gear on a beam reach with 40 knots of wind, other than that it’s been in 1st gear with the vane angled right back the whole time. I’ve used a [popular servo pendulum system] before, and it doesn’t even come close to the performance of the Hydrovane, let alone ease of use. As you can see from the pic we had ours fitted to a HR382. The blade sports a couple of rows of shark teeth marks after a tussle in the Pacific. We used that Hydrovane all the time saving wear and tear on the main steering gear, a problem we had encountered using a [servo pendumlum type] on an earlier boat. Long Live Hydrovane! I’m 60 and have been sailing since I was 5, so I know what I like. This is undoubtedly the best piece of kit I’ve had on any boat ever. It replaced a much older servo pendulum gear and is just amazing in the band of wind and sea conditions it covers. In particular its ability to steer safely on a dead run even when surfing is incredible, as is its light weather performance. I kept thinking, it just can’t be this good. I also dislike having to faff about with things on boats. With the Hydrovane I haven’t had to try any of the settings, vane angle etc., just engage and sit back. So thanks a million it’s the best money I ever spent. Emergency Rudder Yes, Rudder is part of the unit and is in place and ‘Ready to Go’. Further than that, it is a complete, independent steering system. Not inherent. Some have a retrofit rudder to be installed in an emergency. Additional cost. Reliant on other parts of main steering system. In 1976 Sailomat came out with the Sailomat 3040, the first of the servo blades driving an auxiliary rudder. Production was terminated in 1981; failures due to the far greater loads on the system were probably the cause. In 1986 Windpilot introduced their version (Pacific Plus). Since then some other servo pendulum manufacturers have developed their auxiliary upgrades: Fleming (Australia), South Atlantic (Argentina), Autohelm (USA), Sailomat (USA – produced only for a few years). The Hydrovane is an auxiliary rudder system (has it’s own rudder) that is powered by wind on its large vane. However, most of the other auxiliary rudder style systems on the market are servo-driven – meaning they still employ a servo blade and derive their power from the movement of the water. Instead of lines to the boat’s wheel/tiller to drive main rudder, there are connection to the unit’s own auxiliary rudder. There is also a ‘trim tab’ driven system in the Autohelm. So unlike the standard servo pendulum systems, these servo-auxiliary systems are directly steering the boat with their own auxiliary rudders. Like the Hydrovane, the loads they are dealing with are huge in comparison compared to servo units. The servo-driven auxiliary rudder systems are a better comparison to the auxiliary rudder Hydrovane, and all are similar in price. I’m now in the Galapagos Islands and the Hydrovane has been absolutely rock solid so far. The test-run was a down-wind sail in heavy seas along the North coast of Colombia. I’ve had experience with [3 other types of windvane, including 2 servo-auxiliary models] and I can honestly say that the hydrovane has performed much better than any of the others so far. I’m without a doubt a happy customer. Independent Rudder Yes, Independent steering system. Rudder is part of the unit. Yes, Independent steering system. Rudder is part of the unit.